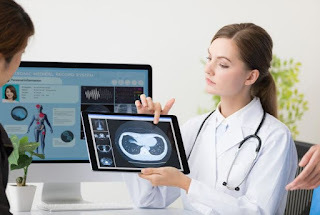 Computerized Axial Tomography or CAT scan is one of the medical imaging techniques which is used for the production of cross-sectional images by using many x-rays measurements. CAT enables doctors or any users to see what is inside the body or any other object obviously. CAT is used widely in medical imaging purposes for the diagnosis and treatment of many diseases. The x-rays CT is the most common form of CAT however, there are other many types which are used for various purposes. Historically, the generation of these images was perpendicular to the axis of the body but in modern scanners these images can be reformatted as a 3D volume of the structure. CAT is mostly used in medicine but it can be used in other fields such as imaging ceramics and testing the non-destructive materials. CAT exams are performed by users who are called radiographers. In the next section of this article we will discuss the uses and advantages of computerized axial tomography. ü CAT is used for the scanning of head for the detection of bone trauma, tumors and infraction. This CAT scan is also used in CT-radiosurgery for the treatment of tumors and other treatable conditions by using N-localizer device. ü CAT is used to scan lungs for the detection of both acute and chronic changes in their internals. ü Pulmonary embolism can be diagnosed by using computed tomography angiography which is used as a CT contrast for visualizing arterial vessels throughout the body. ü The information about cardiac anatomy can be known by performing a CT scan of the heart. This scan will be used for detecting and diagnosing the coronary artery disease. It's also can be used in the field of heart valves repair and replacement. Coronary CT angiography and coronary CT calcium scan are considered as the main forms of cardiac CT scan. ü Abdominal disease can be diagnosed by the use of CAT technique. This scan will help doctors in the staging and diagnosis of cancer. It's also widely used for investigating acute abdominal pain. ü Fractures which occur to the axial skeleton can be easily recognized by the use of CAT scan. ü The production of internal and external 3D representations of components can be done by the use of CT scanning. ü CAT can be used for internal inspection of components. ü CAT scan can be used in many engineering applications for analyzing and detecting elements. ü Museum artifacts can be conserved and imaged by using CAT scanning. ü CAT scanning can be used as an application in transport security specifically for airport security. This scan helps in analyzing materials for explosives detection and also can be used for object recognition.